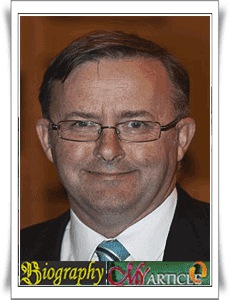 Anthony Norman Albanese born 2 March 1963) is an Australian politician who represents the Division of Grayndler for the Australian Labor Party as well as being the party's spokesperson on Infrastructure, Transport and Tourism. Previously he served as Deputy Prime Minister of Australia, Minister for Infrastructure and Transport, the Minister for Broadband, Communications and the Digital Economy and the Leader of the House of Representatives. He has been a member of the Australian House of Representatives since 1996. Albanese was born in the inner Sydney suburb of Camperdown and was educated at St Joseph's Primary School in Camperdown and St Mary's Cathedral College in Sydney. He was raised by a single mother and said she raised him with "three great faiths: the Catholic Church, the South Sydney Football Club and Labor", adding that he had always remained faithful to the latter two. After finishing school, he worked for the Commonwealth Bank for two years before studying economics at the University of Sydney. There he became involved in student politics and was elected to the Students' Representative Council. It was also where he started his rise as a key player in the left faction of the Labor Party. Albanese completed his degree and took on the role of research officer to the then Minister for Local Government and Administrative Services, Tom Uren, who was to become something of a mentor to him. In 1989, the position of Assistant General Secretary of the New South Wales branch of the Australian Labor Party became vacant when John Faulkner was chosen for a Senate seat and Albanese took on the role for the next six years. In 1995, he returned to policy work as a senior adviser to the Premier of New South Wales, Bob Carr. When Jeannette McHugh announced she would not recontest her seat of Grayndler at the 1996 election, Albanese won preselection for the seat. The campaign was a difficult one, with aircraft noise a big political issue following the opening of the third runway at Sydney Airport, and the newly established No Aircraft Noise party (NAN) having polled strongly in the local area at the 1995 NSW election. Veteran political pundit Malcolm Mackerras predicted NAN would win the seat. However, they ran third, with less than 14% of the vote, and Albanese was elected with a comfortable 16% majority. In his maiden speech to parliament, he spoke at length about aircraft noise and the need to build a second Sydney Airport, as well as his support for funding public infrastructure in general, multiculturalism, native title, the social wage and childcare. He concluded by saying, "For myself, I will be satisfied if I can be remembered as someone who will stand up for the interests of my electorate, for working class people, for the labour movement, and for our progressive advancement as a nation into the next century." Albanese is married to Carmel Tebbutt, former Deputy Premier of New South Wales and the member for the state electoral district of Marrickville, which overlaps with Grayndler in Sydney's inner west. They have one son. Albanese describes himself as "half-Italian and half-Irish" and a "non-practicising Catholic". He is also a music fan who reportedly once went to a Pogues gig in a Pixies shirt and intervened as Transport Minister to save a Dolly Parton tour from bureaucratic red tape. In 2013, he co-hosted a pre-election special of music program Rage and his song selection included the Pixies and Pogues along with the The Smiths, The Triffids, PJ Harvey, Hunters and Collectors and Joy Division. As a lifelong supporter of the South Sydney Rabbitohs, he was a board member of the club from 1999 to 2002 and influential in the fight to have the club readmitted to the National Rugby League competition. During October 2009 The Sydney Morning Herald reported that Albanese had opposed an attempt to appoint the former Liberal Prime Minister John Howard to a senior position in the NRL. Albanese admitted he had phoned the NRL chief executive, David Gallop, as well as other league officials, to advise them against the idea. He then implored officials at Souths to help stop the suggestion from gaining momentum. In 2013, he was made a life member of Souths.